Berry cobbler. Perfectly sweet and saucy berries. Fluffy, delicious biscuit topping. Made in 5 minutes. In a microwave. If you don't like the sounds of that, than I don't know if we can be friends. I know, I know. You're probably like "What is this girl doing giving me a recipe made in a microwave? Like, is that even cooking?" Friends, I can promise you it is. 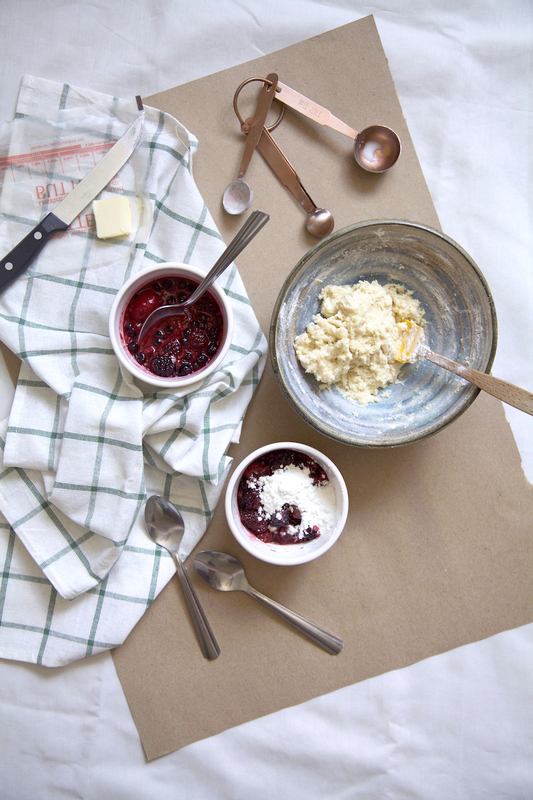 And even if it maybe kind of isn't, the results are so yummy and so quick that you won't even care if it's a full on a recipe, a scribbled list of ingredients or a hodge lodge of supplies that gets more of this berry cobbler into your mouth. Of course, a full on pan of berry cobbler (or really any full-sized dessert) is always a nice treat. But sometimes (read: a lot of times) we don't actually have the time to make these big fancy things, and, even if we did, sometimes, when you want dessert, you want it NOW, not 5 hours from now. Case in point, you just poured your afternoon coffee but have nothing to eat with it, or you're sitting down to view an episode of your favorite show and wishing you had something to munch on while you watch, or you just have to have dessert like NOW but, horror of all horrors, you have NOTHING in your fridge/pantry/house ready to eat. Such was the case when I came up with my 1-minute coffee cake in a mug recipe, and such is the case today with this berry cobbler in a mug recipe. I happened to NEED dessert like yesterday, and with summer fruit coming into season, I was like "Lemme be all healthy and eat lots of fruit!" And then I was like "Lemme be even healthier and turn this into a full on meal by adding a nice biscuit on top....ya know for complex carbohydrates and such." And of course, for a serving of calcium, I finished it off with whipped cream...le duh! It was basically everything I had hoped and dreamed for and it was ready in under 5 minutes. In other words, I (and you) have time to make at least one of these a day. Talk about an easy way to get those daily servings of fruit in! P.S. If you like this recipe, you'll also love my 1-Minute Coffee Cake in a Mug! 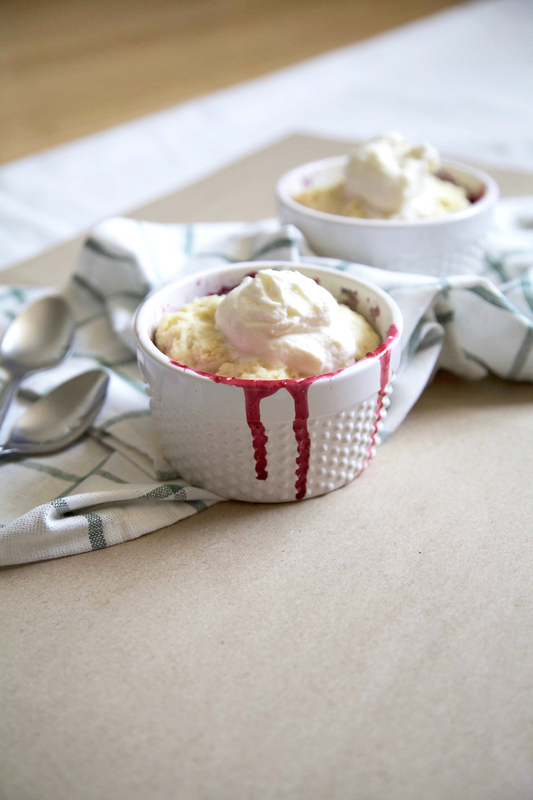 In a microwaveable cup, mug or ramekin mix the berries, cornstarch, 1 1/2 tablespoons of sugar and vanilla. Stir until no clumps of cornstarch remain and everything is combined. Set aside. In a separate microwaveable bowl, melt the butter. Then stir in the sugar, salt and baking powder. Quickly whisk in the milk. Lastly, add in the flour, stirring until well combined, but making sure not to over-mix. Top the berry mixture with the topping mixture. Microwave for 1-1 1/2 minutes. The topping will puff up a little as it cooks, but as long as your cup is at least 8 ounces, it shouldn't bubble over. Once done, carefully remove it from the microwave and allow to cool for a couple of minutes (it will be super hot so watch your fingers!). Top with ice cream or whipped cream, if desired (but highly recommended), and dig in! This recipe can easily be doubled, tripled, etc. However, I would suggest cooking only one cobbler in the microwave at a time. Feel free to use just one kind of berry, a mix (I used a Trader Joe's frozen mix of raspberries, blackberries, blueberries and strawberries), or try adding in other fruit, like peaches. To easily defrost frozen berries (if you're using them), simply place them in the container you'll be using and pop them in the microwave for a minute or two before adding in the rest of your ingredients. If you like your berries to be more saucy, use only half of the cornstarch. For a sweeter dessert, double in the amount of sugar in the berries. For easy whipped cream topping, simply add your desired amount of heavy cream, a splash of vanilla and a little sugar to a jar with a tight light (I use a mason jar). Then, give it a good shake for about a minute or so and voila! Whipped cream!